"This event's been on my mind for a while now," Wallace said, his voice still slightly shaky in the moments after his improbable victory. "It's the only World Series of Poker event I really wanted to play other than the Main, but the Main's not really feasible unless I satellite in." The satellite route seems to agree with Wallace, as he's taken advantage of the inexpensive option several times over the last few years while accumulating four small cashes in regional tournaments. "That's how I do any tournament I've ever played, just satellite in," Wallace said. "So any cash I've ever had, I've satellited in." Those four cashes amounted to $10,782 in winnings, a respectable sum to be sure, but Wallace's big win here tonight boosted his bankroll by $226,985 - representing an astonishing return on his modest investment. "I walked in and I was actually just going to pay out of pocket to register," Wallace remembered. "But on the way I walked through the single-table satellite area and heard a call for 'one seat available, $175 PLO.' So I won that and was freerolling for this." Departing from the Indianapolis suburb of Carmel, Wallace flew to Los Angeles and then Phoenix as part of his duties as Sales Director for Traders Point Creamery, before detouring through Las Vegas to partake in a little poker. "This was on my radar so I knew I was going to swing it," Wallace said of his fateful decision. "Fortunately, my company supports me and allows me to do some things like this. I drove here from L.A. on Wednesday, hit the single-table satellite that night, and here we are." Asked about his decision to play Pot-Limit Omaha in lieu of Texas Hold'em, especially with the Rio packed with recreational players partaking in the Monster Stack festivities, Wallace explained that he simply stayed true to himself. "PLO's my game of choice," Wallace said. "I do play a lot of cash in my hometown near Indianapolis, we have great cash games, and I almost exclusively play PLO. I don't play much No-Limit Hold'em cash anymore, it's PLO for the most part, and I'll play the occasional No-Limit Hold'em tournament. I really like the game of PLO, I feel like it suits my strengths really well. I try to stay tight-aggressive in position, and I don't get overly aggressive early on, try to wait it out because I think people tend to get a little too aggressive in PLO." "Now, if you watch how I played that heads-up match," Wallace continued with a little laugh. "You'd probably say 'what is this guy talking about?' I mean, I completely shifted gears when we got heads-up. I know (Neumann) was a very skilled PLO player, and I knew he was somewhat aggressive, so I wanted to fight fire with fire. Come out and be a little more aggressive than him. I think that kind of put him off his game a little bit, but man, it was still a great match. It was an amazing match." Wallace entered his heads-up duel with the German-born Neumann facing a 2:1 chip disadvantage, but he was fortunate enough to crack aces early on, reversing their respective positions before the two settled into a prolonged battle for the bracelet. Neumann - a successful pro on the European circuit who final tabled the $10,000 buy-in Pot-Limit Omaha World Championship last year - managed to wrest the chip lead back from Wallace, and at one point coming back from break the pair sat dead even with 3 million chips each. From there Wallace slowly eroded Neumann's stack until the climactic hand played out. Wallace's path to the final table, like so many other players before him, was paved with a touch of good fortune along the way. He finished Day 1 sitting in 84th position out of 129 remaining runners with 26,700 chips - a far cry from Neumann's 97,200 - but by the time Day 2 was in the books Wallace had surged into the overall lead. "Day 1 was fairly steady for the most part," Wallace said of his progress through the tournament. "Ended up slowing down and I was a little short, but I just stayed the course. On Day 2 I was short most of the day, up until the last level when I went from like eighty-thousand to chip leader. I did get lucky on one particular hand against Jake Bazeley though." That pivotal hand ended the pro's run in 20th place, and to hear Wallace tell the tale, it probably shouldn't have happened at all. "I hit a gutshot on him," Wallace confessed. "I actually thought I had an open-ended straight draw when it was only a gutshot, but I had already committed myself. I kind of hoped that there was a chance he had like a pair with a straight draw and my ace-king could be good if it hit, but fortunately I hit the nuts on the turn. That was for my tournament life, and it was actually the only time up until the final table that I was all in with my tournament at stake." One might suspect that a recent bracelet winner enjoying a six-figure bankroll boost would consider calling in for a sick day or two, but Wallace is just as passionate about his profession as he is about poker. "I've actually always supported Traders Point Creamery," Wallace said of the company, which specializes in bringing organic dairy products fresh from the farm directly to restaurants and consumers. "I've always bought their products and believed in what they do, and I was fortunate enough to get offered a job there. So I'm working for a company that I really believe in, one that empowers me to make decisions, and I think we've got a really great thing going. I'll be back to work on Tuesday, still the same guy, just with a few more zeros and a new bracelet." While the gold bracelet will always be one Wallace's more prized possessions, the father of two young children has other plans for those extra zeros in his bank account. "I have two kids at home," Wallace said, choking up when mentioning his growing family back home in Indiana. "And one on the way. I was torn, because I actually missed my daughter's birthday to play in this. She turned three on Thursday, so this is for my family. It's going to get us in a better spot." Event #26 of the 2015 World Series of Poker made history, as the $1,000 Pot-Limit Omaha event attracted the largest field ever assembled to play a live poker tournament of the non-Texas Hold’em variety. In total, 1,293 players took a shot at the game that's fast becoming the preferred poker variant for a new generation, breaking a record set just a year ago in the very same event. Along with a gold bracelet to commemorate the most memorable trip of his sales career, Wallace takes home $226,985 in winnings. Brandon Shack-Harris defeated a field of 1,128 last summer to kick off one of the more dominant WSOP performances in recent memory. Although he returned to attempt a title defense Shack-Harris fell short with a Day 1 exit, but he was far from the only one to bow out early. The previous champion was joined by more than 1,100 other players who were culled from the record-setting field during a frenetic, fast-paced first day of play. The money bubble burst with minutes to go in Day 1 as the final 144 survivors earned a cash, and just 129 were left when Day 2 began. Another grueling day of action whittled that number to 16, with none other than Wallace leading the way. Other notable players to make the money in this event include the aforementioned Bazeley (20th), 2012 WSOP Main Event champion Greg Merson (29th), Allen Kessler (31st), Andy Bloch (56th), Mike Leah (66th), Marvin Rettenmaier (78th), Eoghan O'Dea (98th), Jeremy Ausmus (105th), Matt Stout (117th), Joe Kuether (134th), and Tony Gregg (141st). Second Place: Representing the ascendant German contingent that has taken the poker world by storm, Marko Neumann comes from the city of Perelberg, but he's no stranger to Sin City. Neumann final tabled the $10,000 buy-in Pot-Limit Omaha World Championship last year en route to a fifth place finish. Of his 32 career cashes seven have occurred during WSOP play, and Neumann now has more than $1.8 million in reported live earnings to his credit. Third Place: Noah Merritt is an entrepreneur out of Portland, Oregon who cites the poker literature of Phil Hellmuth and Howard Lederer for their impact on his continuing poker tutelage. While he's an idea man by trade, Merritt has quickly taken to the world of tournament poker, amassing six cashes since 2014 - with each prize increasing by an order of magnitude. Starting with a modest $447 uptick in a Daily Deepstack event last year, Merritt then cashed for $2,893 two weeks later, followed by $4,411, $4,400, and $25,000 results - before adding $88,801 to his bankroll with this near-miss. 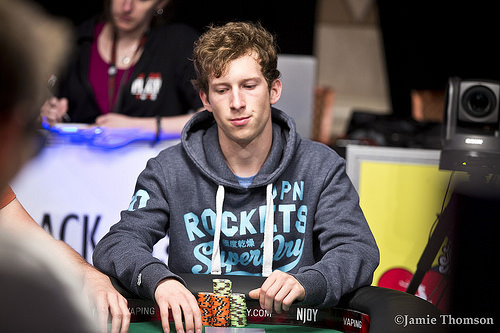 Fourth Place: The WSOP is truly a global game to be sure, and players like Jeroen Choinier prove that every year. From the European nation of Luxembourg, the 24-year old Choinier entered the first bracelet event of his life and promptly doubled his lifetime earnings while nearly achieving poker immortality in his inaugural visit. 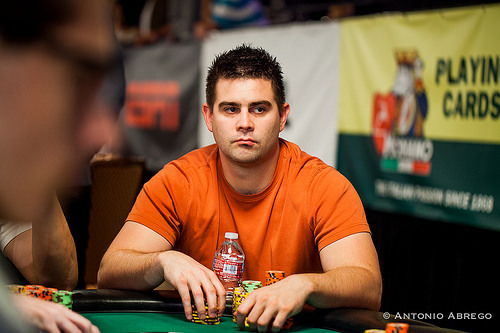 Choinier is hardly an amateur, however, and he made it 15 career cashes since getting started in poker four years ago. Fifth Place: Born and raised in Princeton, New Jersey, Daniel Zack is a 22-year old poker pro who just passed the $100,000 milestone in only his second year on the felt. Zack learned the game online like so many others, splitting his time between the classroom and the virtual card room, and he's now cashed twice each in his first two WSOP summers. The fifth place result is still not his best finish in a bracelet event though, after last year produced a 4th place run in the $1,500 Ten-Game Mix event. Sixth Place: Chase Steely cut his teeth playing online poker in his hometown of Williamsburg, Kentucky, and the professional notched his seventh in-the-money finish at the WSOP. The cash was his third of the summer, following an 88th place run in Event #12 and a 67th place finish in Event #20. 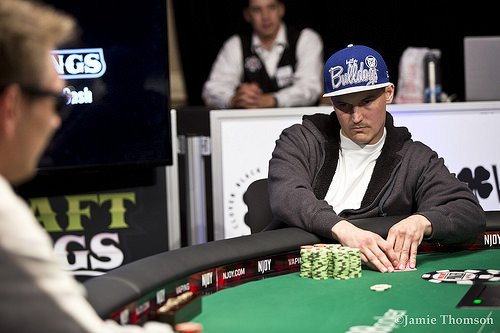 The 30-year old Steely also topped his previous best in a bracelet event after placing 14th in the 2010 edition of $1,500 Pot-Limit Omaha. Seventh Place: Hungarian-born Bala'zs Somodi is a professional poker player out of Godollo who surpassed $200,000 in lifetime earnings with his second WSOP cash. He's made the money 10 times now in tournament play, including a win at the 2011 Casino Austria Poker Tour Main Event for $140,542. Eighth Place: Curtis Krushelniski hails from the town of Leoville in the Canadian province of Saskatchewan, and he made the 1,433-mile commute more than worth it by topping the 13th place run he made in this very same event last year. The $20,830 prize he'll take back to the Great White North represents the 33-year old oilfield worker's second WSOP cash, and most significant live result in five career cashes. 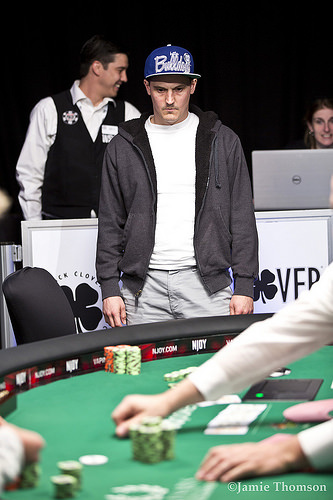 Ninth Place: Las Vegas, NV native Thomas Kearney enjoyed home court advantage here at the Rio, where he collected his third WSOP cash and first final table after near miss last year. The 29-year old Kearney placed 16th in the 2014 $10,000 buy-in Pot-Limit Omaha Championship, and to prove he's more than a PLO specialist, Kearney added a 116th place run in the recently concluded Millionaire Maker event. International Intrigue: A total of 294 international players hailing from 45 different countries competed in the event. Welcome to the Show: There were 58 players who chose this event for their first WSOP experience. Gender Breakdown: Of the 1,293 entrants there were 1,260 males and 33 females in the field. The two players see a flop of and Aaron Wallace checks the action over to Marko Neumann who bets 80,000 Wallace check-raises the pot, a total bet of 400,000. Neumann thinks for the briefest of moments and puts out the call. The turn is the and Wallace leads out for a pot-sized bet and Neumann puts the rest of his stack in. Wallace calls and it is Neumann who is at risk. Wallace is in the lead with a full house, threes full of sevens, but he's not free and clear yet as any seven, six, jack, or queen will give the better hand to Neumann. The river is the and Wallace's rail mobs him as he wins the $1,000 Pot-Limit Omaha bracelet and $226,985. 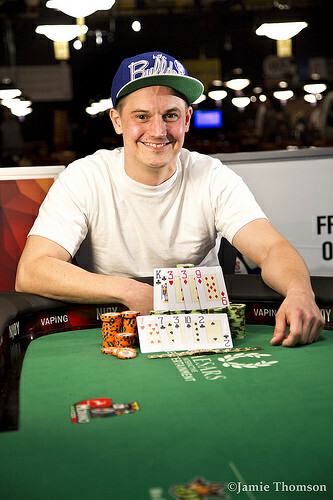 Marko Neumann finishes in second place which is good for $140,353. Aaron Wallace calls on the button and Marko Neumann checks his option. The turn is the . Neumann bets out 100,000, Wallace pots to 460,000. Neumann thinks about it for a bit and folds. Aaron Wallace raises to 175,000 and Marko Neumann calls. The flop is and Neumann check-calls a 175,000 bet from Wallace. The turn is the and Neumann check-calls another bet from Wallace, this time for 425,000. The river is the and Neumann checks a third time. Wallace announces "pot" which makes it a bet of 1.55 million. Neumann thinks briefly and folds. The two remaining players are on a 20-minute break with the chip counts essentially dead even. The two players see a flop of and both players check. The turn is the and Marko Neumann check-calls a 75,000 bet from Aaron Wallace. The river is the and Neumann checks. Wallace bets 175,000 and Neumann check-raises to 500,000. Wallace calls. Neumann shows for the rivered nut straight. Wallace turns over to show that he had a straight on the turn that was second best after the river. Aaron Wallace raises to 125,000 and Marko Neumann calls. The flop is . Neumann checks, Wallace bets 125,000, and Neuman calls. The turn is the . Both players check. The river is the . Neumann bets out 275,000 and Wallace calls. Marko Neumann shows for a queen high flush and Wallace mucks. Aaron Wallace opens to 130,000 and Marko Neumann calls. The flop is and both players check. The turn is the and Neumann check-calls a 125,000 bet from Wallace. The river is the and Neumann checks. Wallace bets the pot - 480,000. Neumann thinks, calls, and shows for a six-high straight. It's second best, however, as Wallace has for an eight-high straight. With that pot Wallace reassumes the chip lead. Marko Neumann raises to 125,000 and Aaron Wallace calls. The flop comes . Wallace bets out 100,000, Neumann calls. The turn is the . Wallace checks, Neumann bets 180,000, and Wallace raises to 390,000. Neumann calls. The river is the . Wallace leads out for 1,180,000 which puts Neumann's tournament life at risk if he calls. Neumann goes into the tank for a few minutes and eventually calls. Aaron Wallace and Marko Neumann exchange a series of raises until all of Aaron Wallace's chips are in play. He's in danger of being eliminated and is well behind Neumann as the German has . Wallace holds . The river is the and a disappointed Neumann ships over half his stack to Wallace. The flop comes . Wallace checks, Merritt checks, Neumann bets 150,000, Wallace folds, Merritt raises to 550,000, Neumann shoves all-in, and Merritt calls. Marko Neumann shows for a set of aces and a spade flush draw. Noah Merritt shows for a straight. The turn is the giving Neumann a full house. The river is the . Jeroin Choiner opens for 100,000 and Aaron Wallace calls from the big blind. The flop comes and both players check. The turn is the and Wallace leads out for 75,000. Choiner moves all in for just under 450,000 and Wallace immediately calls. Wallace has a full house, sevens full of fives, and Choiner needs to hit one of two kings to stay alive. The river is the and Choiner is eliminated in fourth place for $64,457. Jeroen Choiner limps on the button, Marko Neumann calls, and Aaron Wallace checks. The flop comes and all players check around. The turn is the . Neumann checks, Wallace bets 125,000, Choiner folds, and Neumann calls . The river is the . Both Neumann and Wallace check. Wallace turns over for a flush, and Neumann mucks his hand. Jeroen Choiner opens to 100,000 and it folds to Noah Merritt who calls from the big blind. The flop comes and both players check. The turn is the and Merritt check-calls a 60,000 bet from Choiner. The river is the and Merritt check-calls another bet from Choiner, this time it is for 150,000. "You're good," Choiner says and Merritt reveals for a turned queen-high straight. After a series of hands played, the final four have just seen their first flop since returning from dinner break. 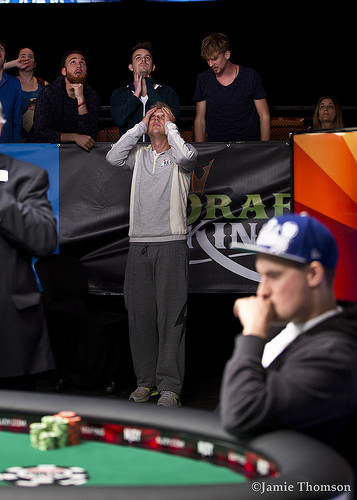 Marko Neumann raises to 100,000, Noah Merritt calls.The flop comes . Merritt checks, Neumann bets 75,000, and Merritt calls. The turn is the and both players check. The river is the . Merritt checks, Neumann bets 175,000, and Merritt folds. The remaining four players are now on a 60-minute dinner break. They will return at approximately 9 p.m. local time. Marko Neumann raises to 90,000 and Noah Merritt calls in the small blind. The flop comes . Both players check. The turn is the . Merritt bets out 110,000, and Neumann folds.